Need to get out of Santa Cruz? – The Connoisseur Carpet Cleaning blog. As beautiful as our area is, sometimes its good for the mind, body and soul to just get the heck out of town for a day or week end. shuckers can call home. A few times a year I’ll pack up my wife (or go by myself on my Suzuki) and head up north and spend the day enjoying the fantastic winding roads, art galleries, hiking trails, barren beaches, bird watching, happy California cows, bay views, and best of all no college kids (my own included) or in your face SCruz locals.. The tiny town of Point Reyes Station is at the bottom of the Tomales Bay and its where I find myself spending most of my time. The sidewalks buzz with activity on sunny weekends. As the coast’s commercial anchor, Point Reyes Station has at least one – and usually just one – of everything: one hardware store, one grocery store, the only bank on the Marin coast, and likewise, the only feed supplier, and the only pharmacy. The downtown eateries, of which there are several, seem almost a mandatory stop for caravans of bicyclists, motorcyclists and all manner of visitors coming through. It’s a free port, blue-collar at its roots, and you can still catch a whiff of livestock in the breeze. I find the best time of year to visit is February through April. The hills are green as can be, the tourists have not arrived and the weather is perfect. Lots of great Bed and Breakfasts around but plan ahead since most only have a few rooms. 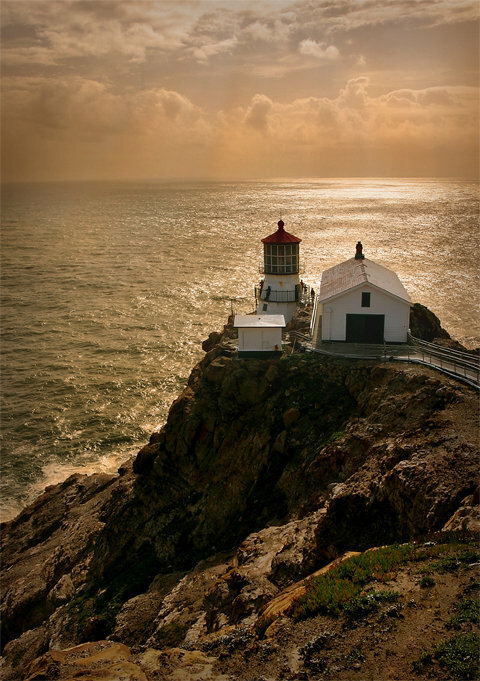 Pack your hiking boots and make time for a visit to the light house at the bottom of the peninsula. A long walk down but well worth the effort. « Stone Showerstall upkeep. » Why Think Local?